Sturm, Ruger & Company, Inc. (NYSE: RGR) has pledged to donate $2 to the NRA for each new Ruger firearm sold between the 2015 and 2016 NRA Annual Meetings, with the goal of giving $4,000,000. Ruger's donation will benefit the NRA Institute for Legislative Action (NRA-ILA). 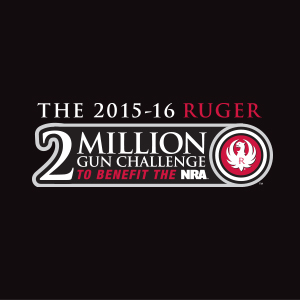 "We're bringing back the One Million Gun Challenge with a twist," said Ruger CEO Mike Fifer. "Our goal is to sell two million firearms between the 2015 and 2016 NRA Annual Meetings. With that, we pledge to donate not one, but two dollars to the NRA for every new firearm sold during that time. We accomplished our goals to support the NRA in 2012, and with the help of our loyal customers, we believe we can do it again."